Do I NEED to Twitter? Maybe. Not all technologies should be embraced by teachers with open arms. As an educator on the front lines of technology integration I keep my eyes open to the digital horizon. I’m interested in finding technologies that can actually make classroom life easier for teachers. Lately, the mass media has become enamored with Twitter as evidenced by the constant invitations to “follow me on twitter.” Before I render a final verdict on Twitter let me describe my experience. 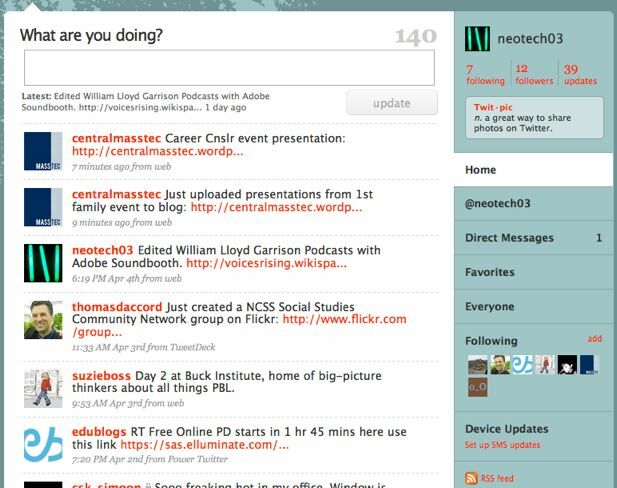 My Twitter birth was August 2008, username: NeoTech03 http://twitter.com/neotech03. I first joined because several colleagues were constantly talking about it. OK, I’ll give it a try. My first impression was positive since my colleagues posted messages that often linked to news articles on relevant issues in the educational technology world. As a Twitter novice, following a few people is easy and satisfying. I’ve posted a total of 39 updates or Tweets. I’m following 7 people and organizations, and I have 12 people or organizations following me. The name of the game on Twitter is to create a network to share resources in a fast and efficient method. Twitter limits each message or post to 140 characters which makes it supposedly easier to consume information. Issue #1, the use of shorthand notation and acronyms to stay within the character limit make deciphering some messages difficult for novices. During March, I joined a wikispace group called The Gr8Tweets Wiki that welcomed educators to experiment and learn more about the educational potential of Twitter. 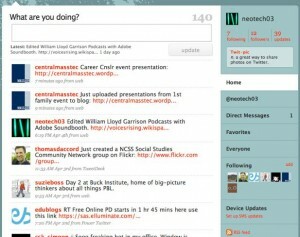 The Gr8Tweets Wiki was an opportunity to build upon my knowledge and comfort level using wikis on wikispaces.com by adding Twitter. Anyone could join the wiki by editing the Who’s Playing page. Participants were encouraged to post messages, sorry…Tweets, using the hash tag, #gr8t. The hash tag is a method that allows Tweets to be automatically tracked and searched. The home page of the Gr8Tweets shows a stream of the last 15 Tweets tagged with #gr8t. In the spirit of Web 2.0 openness I set my profile updates to be unprotected to encourage people to follow me. Protecting updates means that you have to approve anyone who wants to follow and read your updates. Issue #2, Twitter spam. I blocked 5 users who started following my updates with the express purpose of trying to sell me a product. Since the bulk of my updates were posted during March, I’ve noticed an uptick in emails informing me that spammeister is following me. Policing my Twitter account may become annoying if the rate increases. Issue #3, Useless tweets. Mixing personal and professional messages is a major issue when considering to use Twitter. I don’t want to know what you had for dinner, but I would put your professional opinion about the impact of stimulus funding on educational technology in the NEED to know column. Another aspect of useless tweets is wading through messages that don’t interest or apply to you. I’ve mainly used my Twitter experience to document my activities implementing technology at the Ferryway School. I can’t imagine managing a network of hundreds, if not thousands of people. I do like the ability to stream updates though, especially embedding them on a wiki page because it documents the many facets of technology integration. My advice to teachers is to spend your time mastering wikis and blogging before committing to Twitter. No, I don’t NEED Twitter. This entry was posted in new technology, Web 2.0 and tagged Gr8Tweets, technology integration, twitter, wiki by Robert Simpson. Bookmark the permalink.